ADULT. is an electro band from Detroit, Michigan that integrates vocals with drum machines, analog synths and electronic/punk elements. They started releasing albums in 1998 under the pseudonymn "Plasma Co." Initially, ADULT. 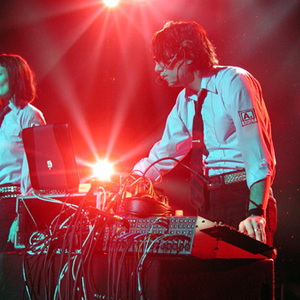 members were unrevealed, but now it is known that the band consists of husband-and-wife Adam Lee Miller (formerly of Le Car) and visual artist Nicola Kuperus. The two members are also the founders of the Ersatz Audio record label. Initially, ADULT. members were unrevealed, but now it is known that the band consists of husband-and-wife Adam Lee Miller (formerly of Le Car) and visual artist Nicola Kuperus. The two members are also the founders of the Ersatz Audio record label. Upon the release of 2005's Gimmie Trouble album (ybmusic), ADULT. announced that they had become a trio with the addition of guitarist Samuel Consiglio, who has since left the band. ADULT. started gaining fame after releasing all of their material independently and touring relentlessly in the U.S. They have also remixed other artists, most notably Felix Da Housecat, Fischerspooner and Bis. Vocalist Kuperus (who is also responsible for the band's album artwork and photography) has sung on the works of other electronic acts including Death in Vegas, Swayzak and Chicks On Speed. ADULT. toured with Trans Am in 2002. In May 2003, the band made its first headlining tour in America, and jaunts across Europe followed soon after. Currently, Miller and Kuperus have focused their attention away from their record label, as the last few ADULT. releases have been distributed by Thrill Jockey Records.